Heya Everyone, I hope your week has started on a good note. 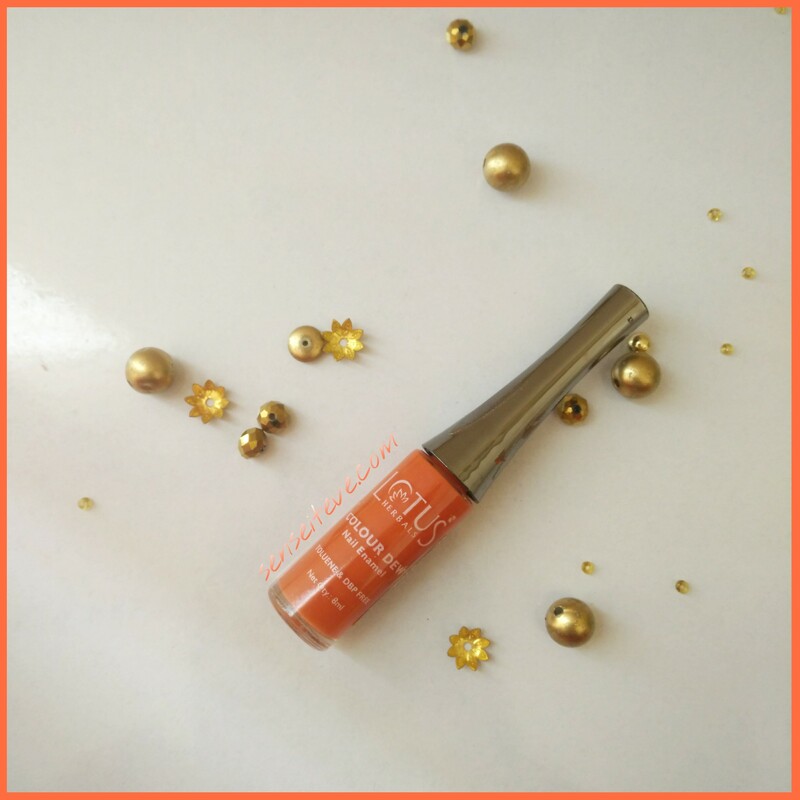 Today I’m here to share one of my most worn nailpaints Lotus Herbals Color Dew Nail Enamel Orange Alert. Unique burnt orange color which brightens up the hands and feet instantly. (I always get compliments when I’m wearing this on my nails). Very affordable. It is 110/- for 8ml. Stays put for 4 days and after that starts to fade from tips, so overall I survive a whole week with this on my nails. Non-streaky application even on layering. I find the brush a bit too long for my medium sized nails. Repurchase: yes. This shade and other shades too. wow…glad to hear that you finished 2 bottles of this color……this color is beautiful…..I love polishes too, but I have so many that I have never bought a second bottle of any color…. This nail polish has beautiful shade of orange, I love it! Such a pretty color. The brush does look a bit long though. Great review. Nice shade and kudos that you finished nail paints. Pretty orange shade. Like the slight rustic feel it has. That what i like..rustic feel to it..
the shade looks so good on your nails Anubhuti.. I love their nail colors soo much as well. This orange looks stunning. Do u find it better than the Maybelline colorshow orange fix? Love the shade! I also don’t like nail polish formula that hard to remove esp those with glitters. Ugh but they’re so pretty to look at. lol I think that long brush is meant for designing, like for nail arts? Sometimes I don’t get why they have to produce long and thin brushes. hehe. Krithi recently posted…US Haul !! The shade is pretty..perfect for summer!